In 1837, a star was added, representing Michigan, bringing the total number of stars on the U.S. flag to 26. There were thirteen stripes representing the thirteen original colonies. The Michigan flag was adopted August 1, 1911 as part of the unfortunate trend creating so many navy blue state flags with state seals. The state's first flag featured on one side a portrait of Michigan's first governor, Stevens T. Mason. On the other side was the state coat of arms and "a soldier and a lady." In 1865, the state flag changed to display the Michigan coat of arms on one side and the United States coat of arms on the other side. However, this was never codified by the legislature. Chief, Azure, motto argent Tuebor; Charge, Azure, sun-rayed rising sinister proper, lake wavey proper, peninsula dexter grassy proper, man dexter on peninsula, rustic, habited, dexter arm-raised, dexter turned, sinister arm with gun stock resting, all proper; Crest, On a wreath azure and or, an American eagle rising to the dexter, tips of wings partly lowered to base, all proper, dexter talon holding an olive branch with 13 fruit, sinister talon holding a sheaf of 3 arrows, all proper. Over his head a sky azure environed with a scroll gules with the motto "E Pluribus Unum" argent; Supporters; Dexter, An elk rampant, proper; Sinister, A moose rampant, proper; Mottoes, On the scroll unending superior narrow argent, in sable, the motto, "Si quaeris peninsulam, amoenam." On the scroll unending inferior, broader argent in sable the motto "circumspice." 2.24 Governor's flag. The governor's flag shall be white charged with the arms of the state. "I pledge allegiance to the flag of Michigan, and to the state for which it stands, two beautiful peninsulas united by a bridge of steel, where equal opportunity and justice to all is our ideal." This pledge was written and copyrighted by Mr. Harold G. Colburn. It was accepted into law by the Michigan legislature (Public act 165 of June 13, 1972, Chapter 2 Section 2.29). 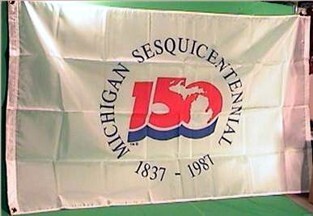 This photo of Michigan sesquicentennial flag was shown on e-bay (site no longer available). A bill for a new Michigan flag design has been proposed Wednesday, Nov. 9, to the state Senate. The bill, introduced by Sen. Steven M. Bieda, D-Warren, proposes enacting a flag commission, who will control a state flag design contest. A bill for a new Michigan flag design has been proposed Wednesday, Nov. 9, to the state Senate. The state military crest, which is the crest used in the coats of arms of units of the National Guard, as granted by the precursor organizations of what is now the Army Institute of Heraldry. The official Institute of Heraldry blazon is "A griffin segreant or."